Myles Tobin is a soft-spoken man who does not seek the spotlight, but it was focused squarely on him March 26. 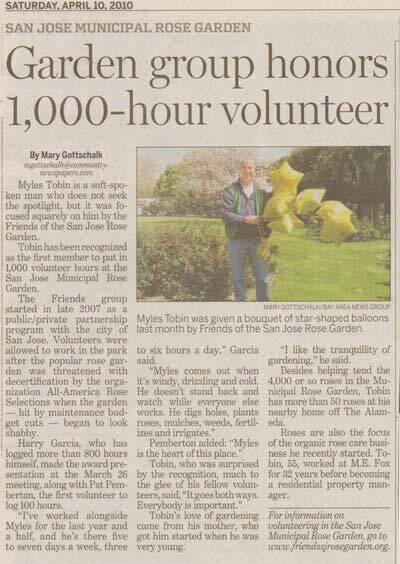 At a meeting of the Friends of the San Jose Rose Garden, Tobin was recognized for being the first member to put in 1,000 volunteer hours at the San Jose Municipal Rose Garden. The Friends group started in late 2007 as a public/private partnership program with the city of San Jose to allow volunteers to work in the park after the popular rose garden was threatened with decertification by the organization All American Rose Selections when the garden began to look shabby after the city cut back on maintenance because of budget cuts. Harry Garcia, who has logged more than 800 hours himself, made the presentation along with Pat Pemberton, the first volunteer to log 100 hours. “I’ve worked alongside Myles for the last year and a half, and he’s there five to seven days a week, three to six hours a day,” Garcia said. Pemberton added, “Myles is the heart of this place. Garcia recalled that during the warm summer months, Tobin often brings along cookies and lemonade on Fridays to share with fellow volunteers after they put in a few hours of work. Tobin was given a bouquet of gold balloons in the shape of stars with 1,000 on them, symbolizing the gold stars given to each volunteer for each 10 hours of service. Many of the volunteers pin their stars on the distinctive green vests they wear to identify themselves as volunteers at the garden. Tobin wears a few on his vest, but not all 100 that he has earned thus far. He also received a plaque and a cake decorated with red and pink frosting roses, which he shared with everyone. Besides helping tend the 4,000 or so roses in the Municipal Rose Garden, Tobin has more than 50 roses at his nearby home off The Alameda. Roses are also the focus of the organic rose care business he recently started. Now 55, Tobin worked at M.E. Fox for 32 years before becoming a residential property manager. In addition to working with the roses, Tobin makes time to greet the many visitors to the garden. With tourists, it’s often a matter of answering questions or giving them a guided tour. For the regulars who come to the garden almost every day, including one in a wheelchair, it’s a matter of saying hello and letting them know they are welcome, and Tobin remembers their names. “It’s important to be involved in the community,” he says. The successful Friends of the San Jose Rose Garden has attracted volunteers from throughout Silicon Valley.